It’s the start of a new year and I realize that the past 2 months have not been very productive for me. I’m in the middle of a lack of inspiration funk. This is one the few things that I have finished in a while. The painting is of some of the attractions and scenery from Disney’s Animal Kingdom theme park. For Christmas I was given the book Secret Stories of Walt Disney World by Jim Korkis, and after finishing it, I was inspired to do some Disney themed art. This is a fun book that is filled with 2 page stories all about different subjects that deal with Walt Disney World’s theme parks, resorts, employees and anything remotely Disney related in the Florida area. I first heard about Jim Korkis from podcasts that he has been on and his knowledge of Disney is second to none. In fact, he has several books out about Disney, two more that I have are, The Vault of Walt, which has 4 volumes (of which I have the first 2). They are also fun and quick reads. Lots of fun and interesting stories are in these that any Disney theme park fan will enjoy reading about. As I was reading the book I decided that I wanted to do something that was related to the stories I had read in the book and I decided that would be from the Animal Kingdom section. 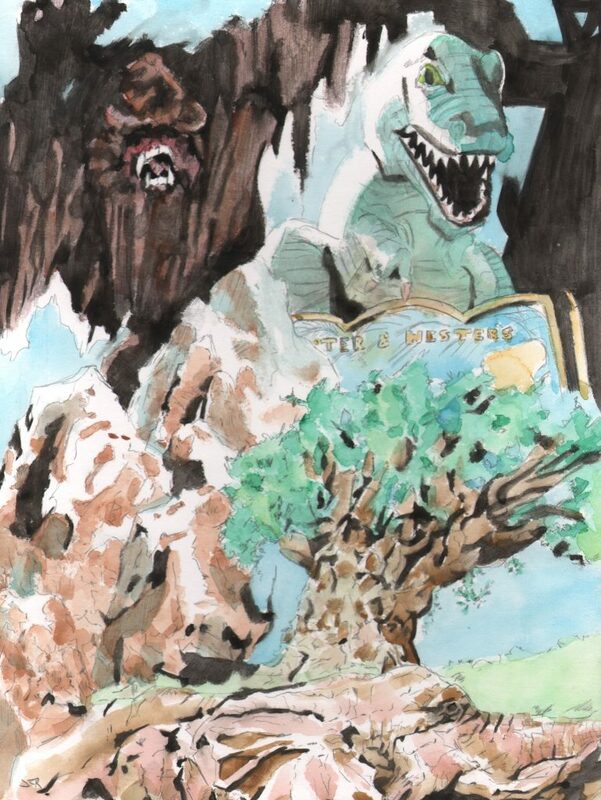 So, this painting has the Yeti and the Everest mountain from the Expedition Everest ride, a piece of the dinosaur that stands above the sign for Chester & Hester’s Dinosaur Treasures store and at the bottom is the Tree of Life with an elephant sculpture. I have another drawing to post later this week that I forgot to post a few months ago. Hopefully I can jump start some more artwork soon.